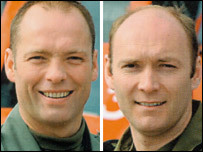 Two pilots from RNAS Culdrose are the latest to be recognised for their bravery during the Boscastle floods. The men from 771 Squadron received the Queen's Commendation for Bravery in the Air at RNAS Culdrose on Wednesday. Captain Pete McLelland and Lieutenant Michael Scott flew the first search and rescue Sea King helicopter to reach the Cornish village last August. They airlifted stranded men, women and children from the roofs of flooded buildings in the village. More than 100 people were rescued on the 16 August when a 3m (10ft) wall of water crashed through Boscastle, leading to the biggest peacetime rescue in Britain. Lt Scott, the co-pilot, positioned and hovered the helicopter over the damaged buildings despite the dangerous weather conditions and nearby power cables. It was Capt McLelland who initiated the "major incident" alert requesting all available rescue units to be scrambled to the scene. No-one was killed in the floods, despite the devastating damage. Many said that was thanks to the professionalism of the rescue services and the courage of people in the village.